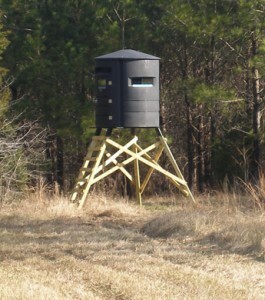 New at J & N Feed and Seed: The Sportsman’s Condo. With a Sportsman’s Condo, neither rain, nor snow, nor slicing arctic winds can keep you from maximizing your time in the field. This one-piece modern hunting fortress has no seams to leak, rattle, rust or rot. For the hunter who is serious about spending more time in the field and increasing his chances of spotting that trophy, the Sportsman’s Condo J is ideal. These blinds can be used either as ground blinds or with the addition of an All-In-One Base Stand, which elevates safely up to 10ft. for the ultimate hunting experience. Click to see the models available. This entry was posted on Friday, August 1st, 2014 at 6:50 pm	and is filed under News & Updates. You can follow any responses to this entry through the RSS 2.0 feed. Both comments and pings are currently closed.